At the end of January 2019, Russian Foreign Minister Sergei Lavrov traveled to the Maghreb, visiting Algeria, Morocco and Tunisia. According to Lavrov’s spokesperson, the trip was conceived to discuss the state of “bilateral relations […] and the regional and international situation” in addition to coordinating “on the settlement of the problems existing in the Middle East and North Africa, as well as the Sahara-Sahel region” (TASS, January 23). 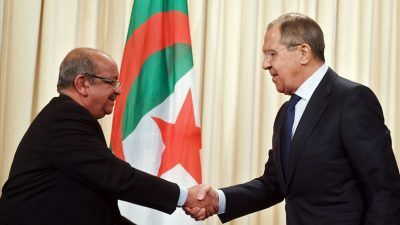 Among the three, Algeria is historically Russia’s closest partner in the region: a crucial ally during Soviet times, Algiers also signed a Strategic Partnership with Moscow in April 2001. Algeria remains a major purchaser of Russian weaponry and an important partner in the energy sector; indeed, Russia’s Transneft and Gazprom have deepened their cooperation with Sonatrach in recent years (El Watan, December 13, 2018; Transneft.ru, September 20, 2017). In addition, the two countries are exploring new opportunities in other sectors: earlier this year, Russia announced it might start producing Lada automobiles in Algeria (TASS, January 30, 2019). Economic issues were central to Lavrov’s meetings in Morocco and Tunisia as well. The importance of the former has increased sharply over the past few years, after the Joint Strategic Partnership and several economic agreements signed in 2016 and 2017, respectively (Le1.ma, January 25, 2019; L’Economiste, October 12, 2017; Le 360, March 15, 2016). As for Tunisia, while being historically marginal for Russia, its importance has been increasing, particularly as it became a major destination for Russian tourists over the past few years (Business News Tunisie, January 28, 2019). This diplomatic trip aptly represents the Russian approach to the region. Since its efforts to reestablish itself as a relevant Mediterranean actor following the decline of the 1990s, Russia has adopted a pragmatic and opportunistic stance regionally. Moscow is open to deepening relations with whoever is willing to do so, independently of their historical ties with Russia, specific ideological and geopolitical preferences and relations with other countries (see Jamestown.org, March 8, 2018). As such, Russia manages to nurture and strengthen ties with two enemies like Algeria and Morocco simultaneously, without too many problems. The same approach informs the Russian stance in other regional contexts, for instance in Libya. While the common perception suggests that Russia has only one major ally in Libya—General Khalifa Haftar—the reality is more nuanced. Besides its close ties with Haftar, Moscow maintains good relations with many other relevant domestic actors, including Fayez al-Sarraj (the prime minister of the United Nations–backed Government of National Accord) as well as forces even more explicitly at odds with the Libyan general, for instance several groups from Misrata (see EDM, March 13, 2017; Libya Herald, April 19, 2017). – strengthening and stabilizing the Russian presence on the shores of the “Warm Sea” par excellence. The latter is possibly the most significant long-term geopolitical driver of Russian foreign policy. Since the times of the second Russo-Ottoman war (1676–1681), Russian leaders have been looking for ways to guarantee unrestricted access to the Black Sea and the Mediterranean. However, this does not entail, automatically, the establishment of a Russian naval base near Benghazi in Libya or permanent access to the local port, as some claim—even though the issue of accessing the Benghazi seaport was already on the agenda during Muammar Qaddafi’s rule (Libyan Express, October 9, 2018; Reuters, January 16, 2009). A greater role in Libya can serve Russia in many ways. It can facilitate the establishment of future bases, if needed; represent a tool of influence over the southern flank of the North Atlantic Treaty Organization (NATO); and reduce the reliance on other Mediterranean allies for maintaining a presence in the basin. Lavrov’s North African tour also had a broader regional meaning. For Russia, a full acceptance of Syria back into the Arab League is crucial, for legitimacy and geostrategic reasons (Al Jazeera, January 26, 2019). This topic was central in the diplomatic visit to Tunisia. First, Tunisia will host the next Arab League summit in March 2019. And second, Tunisia is also the place where the revolutionary wave of the Arab Spring started. While in Tunisia the Arab Spring created the conditions for the beginning of a democratic process that, despite numerous economic problems and troubles, has continued to hold, in Syria the revolution turned into a bloody, internationalized civil war. As such, Tunisia welcoming the return of Syria into the Arab League would represent a major symbolic and geopolitical gain, not only for Damascus but also for Moscow. Importantly, it would seal Russia’s renewed influence in the greater Mediterranean region since the survival of the Syrian regime has been a major victory for the Kremlin.